Chabad of Brookville was established with the goal of welcoming all Jews regardless of affiliation or background, strengthening identity and pride in our Jewish heritage. Focusing on education as a vehicle for Jewish continuity, Chabad of Brookville actively brings Judaism to adults as well as children in a fun and educational manner. Through its regular classes, lectures and events, Jewish children and adults gain a heightened awareness of who they are as Jews. Addressing an area of vital importance, Chabad of Brookville operates a much-needed and effective Hebrew School for children with special-needs. With professional, certified special-education instructors, Chabad is able to successfully reach these children on their very own level. 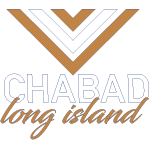 Chabad of Brookville services the entire spectrum of Jewish community throughout the year, catering to all their needs in a friendly and non-judgmental atmosphere.